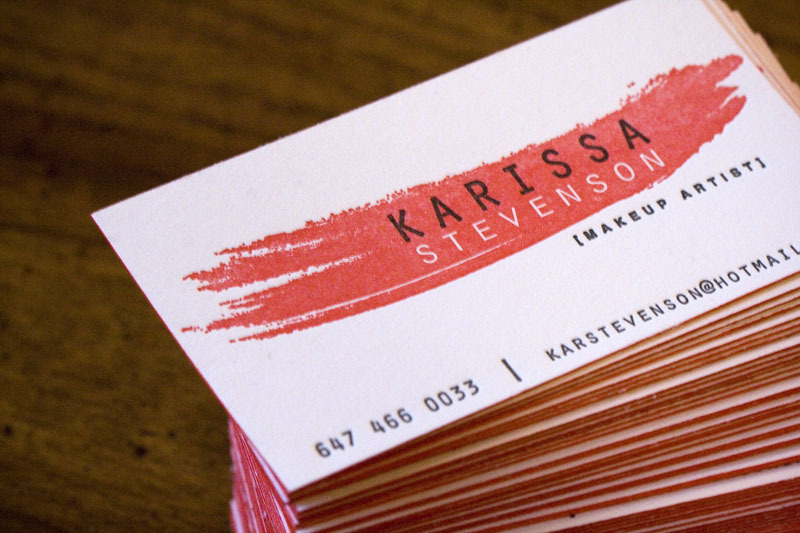 This is a fantastic business card we printed a few weeks ago for makeup artist Karissa. She wanted the swash of colour to as bright as it could be so we took the ink straight from the can. We were also thrilled when she requested edge-painting, which is something we don’t get to do too often. The red border really made the content of the card “pop”. See, letterpress business cards are a good investment! Thanks Karissa and Brittany! Printed on Crane Lettra, 300 gsm, pearl white in 2 colours with matching edge-painting. great desgin. I especially love the brush stroke- perfect size and swoosh! Lovely – edge painting is always such a nice detail! Ah, like a stroke of lipstick! Brilliant!